They strolled towards the river. But it didn't seem to be the right river. It wasn't a river at all. "I told you this was a game," said Wabsworth. "Pretty," nodded the Wabbit. "It's like a painting." murmured Wabsworth. "Canaletto?" suggested the Wabbit. "Artificial topography," agreed Wabsworth. The Wabbit looked all around and took in the scene. "Are we really in it?" he asked. Wabsworth sniffed long and hard. "Yes. It smells of damp mop in a corner." 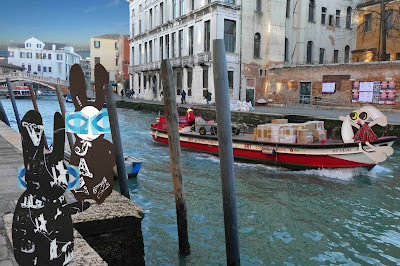 The Wabbit's ears pricked up at the chugging of an outboard motor. "Johnson Evinrude," said Wabsworth. "You can't get better," grinned the Wabbit. He heard a familiar voice but this time he turned and shouted, "Lapinette!" "Wanna lift?" called Lapinette. "What's in the boxes, Gondolier?" yelled Wabsworth. Lapinette yelled back. "Haggis for Burns Night and a case of herring!" The craft edged in sideways and bumped against the jetty. "How on earth did you get here?" asked the Wabbit. Lapinette hopped off and climbed the steps. "It was a magazine competition. And I traded all my points from American Express." "They didn't run to a gondola?" queried Wabsworth. Lapinette shook her head and shrugged. "No-one can." They gazed at the bridge and noted how beautiful everything was. "Bring any weapons?" grunted the Wabbit. Lapinette patted her frock. "A machine pistol disguised as a makeup case and a pack of exploding lipsticks." "Expecting trouble?" smiled Wabsworth. Lapinette laughed. "Trouble expects me."